(VIERA, FL) – Women of a certain age have something to celebrate: themselves! Senior vitality for women takes center stage at One Senior Place on Friday, February 22 at 2:00 PM when the topic turns to mental, sexual and financial health. Sponsored by Whittaker-Cooper Financial Group, Rediscovering Your Best Self After Age 50 will feature advice by women for women on charting a course for overall well-being in retirement. Attendees to the Viera marketplace for boomer and senior resources at 8085 Spyglass Hill Road can browse vendor tables before hearing from Dr. Victoria Follett, Professor at the School of Psychology at the Florida Institute of Technology, along with osteopathic physician, Jamie Burrows from Partners in Women’s Health by Steward Healthcare. Doctors of osteopathic medicine regard the body as an integrated whole, rather than treating for specific symptoms only. Also speaking to attendees will be Laural Brown, Operations Manager for Raymond James Financial Services. Refreshments and door prizes will be provided by Whittaker-Cooper Financial Group, which maintains a satellite office at One Senior Place in Viera. Attendees to Rediscovering Your Best Self After Age 50 are encouraged to call (321) 751-6771 and RSVP to reserve seating for the free seminar and resource materials. For more information about One Senior Place, The Experts in Aging, visit their website at www.OneSeniorPlace.com or call (321) 751-6771. Barbara Fradkin, Social Worker at One Senior Place, thinks women are overdue for the lessons in Rediscovering Your Best Self After Age 50. Rediscovering Your Best Self After Age 50 is just one of the dozens of events presented annually by One Senior Place in Viera. One Senior Place is a marketplace for resources and provider of information, advice, care and on-site services for seniors and their families. To learn more about One Senior Place, The Experts in Aging, visit www.OneSeniorPlace.com or call 321-751-6771. About One Senior Place– Now in its 13th year, One Senior Place, The Experts in Aging, is a marketplace of resources and provider of information, advice, care and on-site services for seniors and their family caregivers in Central and East Central Florida. Completely unique, One Senior Place at 8085 Spyglass Hill Road in Viera is a one-stop information hub and mini-mall “revolutionizing the way America shops for elder care and services.” One Senior Place is home to a wide variety of senior-focused businesses, a resource library and is the site of educational seminars and presentations for seniors. In 2008, One Senior Place was named Florida’s Small Business of the Year by the U.S. Small Business Administration. In Brevard, they were honored as Business of the Year by the Melbourne Regional Chamber of Commerce. A second location, One Senior Place Orlando, opened in Altamonte Springs in December of 2011. More information about One Senior Place and One Senior Place Orlando can be found on the company website at www.OneSeniorPlace.com or by calling 321-751-6771. The Whittaker Cooper Financial Group Inc. is a professional practice, where advisors provide financial planning services for clients in Brevard County and Central Florida. Begun in 1985, Whittaker Cooper Financial Group is headquartered at 1692 West Hibiscus Boulevard in Melbourne, 32901. Financial Advisors include Kenneth Whittaker, CPA/PFS, CFP®, CLU, ChFC and I. Wayne Cooper, CPA. Whittaker Cooper Financial Group maintains a satellite office inside of One Senior Place in Viera, located at 8085 Spyglass Hill Road, 32940. For more information on Whittaker Cooper Financial Group, call 321-723-3352 or visit the website at http://raymondjames.com/whittakercooper/. Whittaker Cooper Financial Group is not a registered broker/dealer and is independent of Raymond James Financial Services. Securities offered through Raymond James Financial Services, Inc., member FINRA/SIPC. Investment advisory services offered through Raymond James Financial Services Advisors, Inc. Raymond James is not affiliated with One Senior Place, the School of Psychology at Florida Institute of Technology or Partners in Women’s Health by Steward Healthcare. ORLANDO, Fla. (January 29, 2019) Since its launch in Fall 2017, Arts in Action classes have been providing performing arts experiences throughout Winter Park and Maitland specifically designed for adults 60 and over. Starting in spring 2019, these programs are expanding to the Dr. Phillips neighborhood, with plans to expand into the City of Orlando. This program is presented by CFCArts and is sponsored in part by the Winter Park Health Foundation, Dr. Phillips Charities, the City of Orlando, West Orange Healthcare District, and AARP. These affordable ten-week courses foster creativity, artistry, and community and are open to participants of all experience levels. CFCArts’ mission is to create opportunities for artists of every age to connect, serve, and perform. Tuition for each 10-week program is $35, with scholarship options available. Spring 2019 courses start February 25 and include Acting & Storytelling, Singing, Dance, Movement & Stretching, and Instrumental classes in ukulele and keyboard (instruments provided to participants). At the conclusion of each program, participants are given the opportunity to perform in a showcase for their peers, friends and families. To register and learn more, visit CFCArts.com/ArtsinAction or call (407) 937-1800 ext 703. Classes this spring take place at venues throughout the Winter Park, Maitland, and Dr. Phillips neighborhoods in partnership with the Winter Park Public Library, Maitland Senior Center, Maitland Public Library, Orlando Ballet, Harbor Chase of Dr. Phillips, Calvary Orlando, Rosen JCC, Brookdale Senior Living and St. Luke’s United Methodist Church. 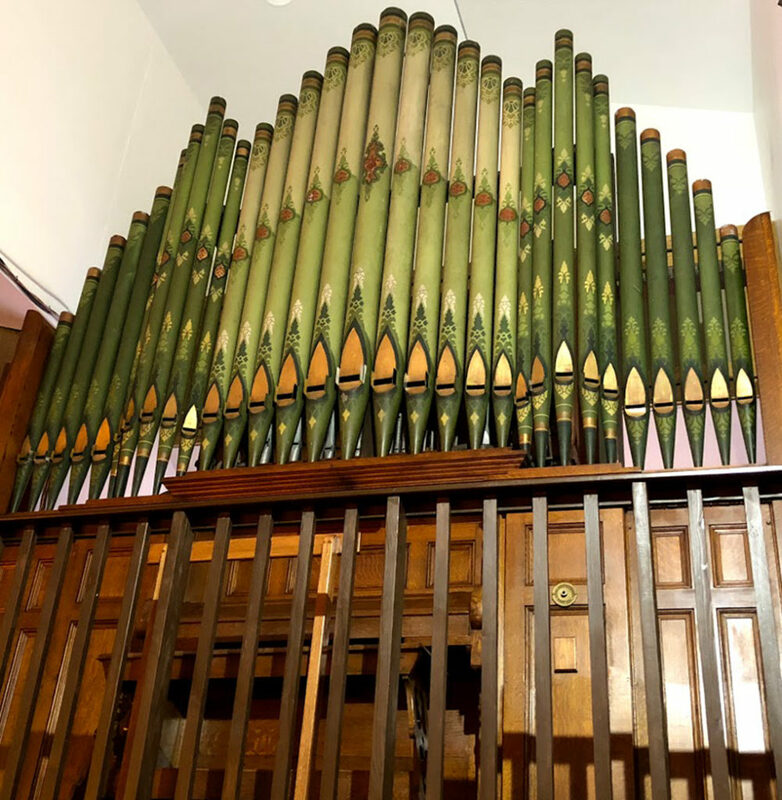 (INDIALANTIC, FL) January 7, 2019— A mechanical pipe organ built over a century ago now proudly swells in the sanctuary of Eastminster Presbyterian Church in Indialantic. Installed in August 2018, the 1906 Kilgen tracker pipe organ will be dedicated in a free concert on Sunday, January 20 at 3:00 PM, to the memory of Lorraine Bemiss, a music teacher and pianist, who served at Eastminster beginning in 1957. The antique instrument, with seven ranks, nine stops and ornate pipes, was rescued from the now closed Westminster Presbyterian Church in Casselberry, Florida and acquired with the help of the Bemiss Foundation. David Vogeding, Director of Music Emeritus for Eastminster Presbyterian, will be one of the featured organists to play during the dedication concert, along with organist Frank Voltz, a close friend of the Bemiss family. Voltz performed twice for President Ronald Reagan and is in demand as a featured performer on the organ and harp. The public is invited to a reception in the church hall immediately following the dedication concert. For more information, call 321-723-8371 or visit www.epcfl.org. Eastminster Presbyterian Church Director of Music, Teresa Fleenor, explains more about the antique instrument being dedicated. ABOUT DAVID VOGEDING – David Vogeding is a familiar face in the Central Florida music community. Mr. Vogeding obtained a Bachelor of Music Degree in Organ Performance from West Virginia University and a Master of Music in Organ Performance from the University of Oklahoma. He has completed course work for his Doctorate of Musical Arts in Conducting at the University of Oklahoma and has also completed several seasons of study at the Royal School of Church Music in Croydon, England. He served as Organist/Choirmaster for 20 years at St. Andrew’s Episcopal Church in Missouri and has recently retired as the Director of Music at Eastminster Presbyterian Church in Indialantic, where he served since 1992. A member of the American Guild of Organists, he is also Director Emeritus of the Indialantic Chamber Singers, a vocal chamber ensemble he founded in 1999. ABOUT EASTMINSTER PRESBYTERIAN CHURCH – Led by the Holy Spirit, Eastminster Presbyterian Church glorifies God by loving Christ and others in worship, word, and deed. Classic worship services are held each Sunday at 10:00 AM. A contemporary Praise & Worship service is conducted Saturdays at 6:00 PM. Reverend Dr. Tim Rogers-Martin leads the congregation, with ministerial duties shared by Associate Pastor, Rev. Kristy Ray. In 2017, Eastminster Presbyterian Church earned the Earth Care Congregation designation by pledging to care for the earth and creation through an ongoing educational and service initiative. More information about Eastminster Presbyterian Church at 106 N. Riverside Drive in Indialantic, Florida, 32903 may be found on their website at www.EPCfl.org or by calling 321-723-8371. (VIERA, FL) November 26, 2018 – Not every Brevard child will wake up Christmas morning to a pile of gifts under the tree. For the thousands of Brevard parents who struggle to cover the essentials, Christmas presents for their kids are simply out of reach. One Senior Place in Viera will be helping needy families cope, when they host a Holiday Toy Gala to benefit one of Brevard’s biggest toy drives on Friday, December 7 at 6:00 PM at 8085 Spyglass Hill Road. Admission to the smart casual event is free, with a new, unwrapped toy or gift for children or teens. Walmart gift cards are particularly welcome. The large toy drive by His Place Ministries is now in its 16th year and will provide toys and gifts for more than 3000 Brevard children, many of them considered homeless. Collected toys are staged in a room where parents can “shop” on December 20 for free gifts according to the gender and age of their children. Approximately 800 families benefited from the toy drive last year, for children aged from toddlers through 17. Gifts for teen girls are often underrepresented and therefore especially needed. The Holiday Toy Gala and “fun-raiser” is sponsored by A Mother’s Touch Movers and will serve up heavy hors d’oeuvres and desserts, wine and beer at the Viera marketplace for senior resources, with smooth jazz provided by saxophonist, Fred Cavese. Attendees can purchase raffle tickets for various prizes and make additional donations for gift cards if desired. To RSVP for the Holiday Toy Gala, call (321) 751-6771. For more information about One Senior Place, The Experts in Aging, visit www.OneSeniorPlace.com. CEO and founder of One Senior Place, Don Kramer explains why the Holiday Toy Gala is an important event. For information on the dozens of events presented annually by One Senior Place, call 321-751-6771. One Senior Place is a marketplace for resources and provider of information, advice, care and on-site services for seniors and their families. To learn more about One Senior Place, The Experts in Aging visit www.OneSeniorPlace.com. The Seniors Intervention Group is a not-for-profit organization dedicated to sustaining and improving the quality of life for Seminole County seniors. While non-perishable food pantries are filling up over the holiday season, many seniors also struggle to feed their beloved pets. Please help us feed these pets by donating wet or dry cat and dog food this holiday season. Donations will be collected at One Senior Place Greater Orlando located at 715 Douglas Avenue in Altamonte Springs, Monday through Friday, 8:30 a.m. to 5:00 p.m. The Seniors Intervention Group is also collecting non-perishable food items such as cereal, canned soup, canned vegetables, boxed meals (mac and cheese/noodles), instant mashed potatoes, rice, canned tuna/chicken, spaghetti, fruit cups, peanut butter, jelly, microwave popcorn, and Ensure/Boost. Personal hygiene items such as shampoo, conditioner, soap, combs/brushes, toothbrushes, toothpaste, mouthwash, deodorant, Depends, Q-tips, denture cleaner, as well as cleaning products like laundry detergent and dish detergent are also appreciated. For more information about accepted items, please contact Seniors Intervention Group directly at 407-790-1948. Save the Date for Special Veterans Event! One Senior Place, the Viera marketplace for senior resources, will present the sixth annual Every Day is Veterans Day, a patriotic concert event at the Scott Center for the Performing Arts at Holy Trinity Episcopal Academy in Suntree on Saturday, March 2, 2019. The public is invited to the free musical salute to veterans at 5625 Holy Trinity Drive in north Melbourne, 32940. Co-sponsored by VITAS Healthcare, Every Day is Veterans Day will feature a 3:00 PM pre-concert reception for the public, with refreshments and information from numerous veteran and military organizations. At 4:00 PM, “Reveille” will open a patriotic concert by the Space Coast Symphony Winds and Indialantic Chamber Singers, followed by a Posting of the Colors. After a moving rendition of the national anthem by The Indialantic Chamber Singers and soloist Beth Green, the Space Coast Highlanders bagpipe and drum corps will proceed through the 800-seat auditorium. Rousing marches by John Philip Sousa as well as songs of America will be performed for the enjoyment of the audience, which is invited to wear red white and blue in patriotic solidarity. A military chaplain will provide the invocation and benediction for the event and “Taps” will be played at the conclusion of the concert. There is no charge for the reception or the concert and free tickets will be available in the coming months. For more information, call One Senior Place at 321-751-6771. (VIERA, FL) October 29, 2018 – With pinkies held high, attendees to the public meeting of the Legacy Book Club can enjoy Tea & Sweets on Thursday, November 8 at 1:00 PM at One Senior Place in Viera. One Senior Place, the Experts in Aging, will host the Tea & Sweets event, featuring author/poet Donna Puglisi and members of the Cape Canaveral Pen Women, from the Florida State Association of the National League of American Pen Women. Ms. Puglisi will discuss her books, “Diamonds in the Rough” and “Roses and Onions, One Layer at a time” at the Viera marketplace for senior resources at 8085 Spyglass Hill Road. Tea for the free Tea & Sweets event will be provided by Senior Partner Care Services, while Ms. Puglisi will provide cake for attendees. For more information, call (321) 751-6771 or visit the website of One Senior Place, The Experts in Aging, at www.OneSeniorPlace.com. Event organizer Barbara Fradkin of One Senior Place explains more about the unique event. ABOUT DONNA PUGLISI — Donna Puglisi has been writing poetry since she was 12 years old and continues to draw on her life’s experiences in her writing. She grew up in Wisconsin with her parents and two sisters. Her mother was a poet, author, musician and composer. It was through her that Donna developed a love of poetry and the arts. Donna is also a dancer and choreographer. The “Dance of Words” is in many ways a canvas for her writings. Humor, love, nature, tributes to veterans, firefighters and law enforcement make her work unique, touching everyone who reads her poetry. Honesty and passion shines through in her books, “Diamonds in the Rough” and “Roses and Onions, One Layer at a time.” The release of “The Power of Passion, Dancing Barefoot” is anticipated for 2019. About the Legacy Club – The Legacy Club is a free program for Brevard residents 55 and older. Legacy Club members receive free (65 and older) to reduced (55 to 64) admission, on a space available basis, to Brevard Public Schools events (excluding FHSAA playoff games) as well as musical and theater performances. In addition, all members will have access to special events throughout Brevard County. For a membership application or more information, contact Sara Almond, Engagement & Programs Coordinator for Brevard Public Schools, at 321-633-1000 ext 644 or via email at Almond.Sara@brevardschools.org. (VIERA, FL) October 29, 2018 – Up to 30 lucky participants can create a beautiful holiday decoration that will last for years to come, during the free Make a Wreath event on Monday, November 12 at 10:00 AM at One Senior Place in Viera. One Senior Place, the Experts in Aging, will host Make a Wreath as the first in a series of four craft education events with the Cape Canaveral Pen Women at the Viera marketplace for senior resources at 8085 Spyglass Hill Road. Each attendee will receive supplies provided by Whittaker Cooper Financial Group and will be guided through the construction of a white ribbon wreath with gold embellishments by the president of Cape Canaveral Pen Women, Marion Coste. Refreshments for the free Make a Wreath event will be provided by Senior Partner In-Home Care. An RSVP is required to reserve space and supplies. Call (321) 751-6771 or visit the website of One Senior Place, The Experts in Aging, at www.OneSeniorPlace.com. Event organizer Barbara Fradkin of One Senior Place explains more about the craft education series. About the Cape Canaveral Pen Women –The National League of American P​en Women (NLAPW) is a not-for-profit 501(c)(3) organization that links professional women in the arts and promotes the development of their creative talents. Founded in 1897, the League has 81 branches in 35 states. Its members are women who produce creative works in Arts, Letters, or Music. The Cape Canaveral Branch was founded in 1969 by Dr. Elaine Murray Stone. All NLAPW branches in Florida are part of the Florida State Association. The Cape Canaveral Pen Women participates in outreach programs that promote arts in their communities and awards an annual scholarship to a young woman who demonstrates potential in art, letters, or music. The Mission of the League is to encourage, recognize, and promote the production of creative work of professional standard in Art, Letters, and Music, and through outreach activities provide educational, creative, and professional support to members and non-members in these disciplines. The core values of the NLAPW are respect, knowledge, creation and preservation of the arts. Membership is open to women who are published authors, composers of original music, artists whose works have been in at least three juried shows, and allied professionals. For more information, visit http://canaveralpenwomen.org/.